A good routine of brushing and flossing is widely recognized as the most effective protection against plaque. In some cases, interdental brushes may be a practical alternative to flossing. But what about water flossers? You may have heard of these devices and wonder how they work. Let’s take a closer look at the water flosser and see how it is used. 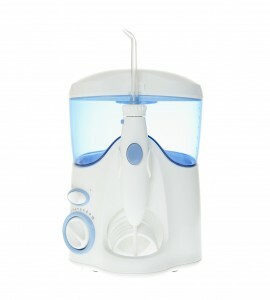 Water flossers, also referred to as water picks, are oral irrigation devices. These devices use pressurized water or jet streams to remove food particles from the interdental spaces, as well as from pockets found below the gum. Water flossers are typically electric and are attached to a water reservoir. Some electric toothbrushes even include a water flossing function. Most dentists don’t recommend the use of a water flosser to completely replace normal flossing. Depending on your teeth and gums, you will likely find that certain foods escape the oral irrigator’s action. You can try using an interdental brush or dental floss after using a water flosser to test its effectiveness in different cleaning situations. In any case, these devices can definitely be used as a supplement to your routine. Is Oral Irrigation Right for Me? Bleeding Gums: The primary cause of bleeding gums is gum disease, which is a bacterial infection requiring attention from your dentist. If you are currently being treated for gum disease, and find that certain hard to clean areas continue to bleed despite good flossing, a water flosser may help address the problem. For example, using a water flosser just before using dental floss can help remove larger food particles, making the use of dental floss easier. Braces: For those with braces, there’s nothing more irritating than having food particles stuck in between your teeth. Without proper cleaning, that food leads to cavities. A water flosser can be used in-between meals to remove food particles, in combination with thorough brushing and even an interdental cleaner. Dry Mouth: Saliva is the body’s natural cleansing agent, and also protects against the buildup of dental plaque. Dry mouth, a condition in which the body produces a lower amount of saliva than normal, can increase the risk of gum disease and developing cavities. Although not a long-term solution, a water flosser can add moisture to your mouth while removing plaque and food particles. Although their popularity has varied over the years, studies show that oral irrigation devices can be used safely and effectively to dilute the acids produced by plaque, and to address the problems mentioned above. If you’re interested in using one of these devices, mention it to a member of the Yuba City Dentistry Group at your next appointment and we’ll make a suggestion that’s best for your circumstances.